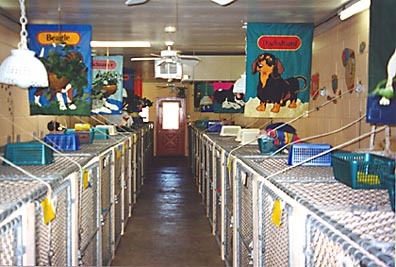 Our Staff takes pride in the clean, well maintained kennel and cattery. The inside runs are air conditioned in the summer and warmed with radiantly heated floors in the winter or your pet’s comfort. The cattery is located in a separate heated and air conditioned building with windows for most units. Other small critters and birds are welcome. Remember… a kennel is NOT “crating” a pet. Recess: Free to run in the spacious yards for 15 minutes. Pooch Best Friend Recess: Play ball, frisbee, walk on leash, enjoy the outdoors with a staff member for 15 minutes. Cat Best Friend Recess: Tree climbing, brush and pet from staff member for 15 minutes. Breakfast in Bed: A little egg, toast and bacon bits in the morning. Busy Bone: Peanut butter filled bone or Kong. Happy Hour: Some low fat yogurt in a cone before bed. We will provide door to door service from your home to the kennel and back. If you want to reduce the cost of this service you can drop off your pet at 8082 Watson Road at our Mrs. Anderson’s grooming shop and get round trip service from there. Complete grooming services for dogs and cats are available while your pet is boarding or better yet on the day he checks out so he’ll be at his best for the grand homecoming. Nail clipping at no charge with a bath. We’d be glad to quote you a price when you drop off your pet. Grooming on a daily basis is available for non-boarders.